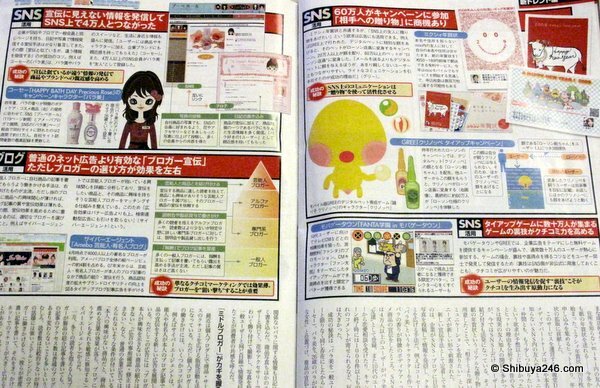 This months issue of 日経ＴＲＥＮＤＹ magazine, June, 2009 (yes, the magazines always seem to come out about 2-3 weeks before the actual month), carries a very interesting article on Twitter, blogging and SNS. It compares the contrasting styles of these three and looks at what is happening in Japan. There are references to Japanese services like mixi, Ameba, Poupeegirl and smart.fm (previously iknow.co.jp) also gets a mention. with so many people, particular the younger generation, embracing SNS in numbers reaching over 10,000,000, its advertising market appeal is increasing. With media companies suffering like many businesses in the current economic downturn, they are now focusing on ways to reach audiences at lower costs and they have their sites set on SNS. In the US, Twitter has already emerged as a front runner for combining the power of blogging with SNS, in a micoblogging format. In Japan in the area of fashion and language study members are increasing on sites which specifically cater to those needs. The main example of a successful media campaign highlighted is that of Barack Obama’s Presidential campaign. 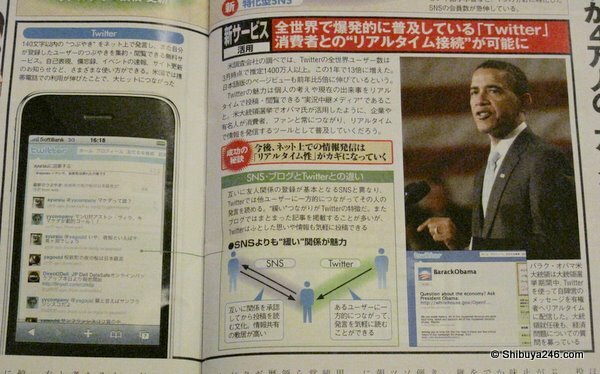 The campaign was very popular in Japan due more to traditional media than channels such as Twitter. Nonetheless, politicians around the world have had reason to learn from the campaigns successful use of technology, and Japan is no exception. On the left page of the article you can see 2 sites higlighted, smart.fm and poupeegirl. smart.fm is a good way to learn a foreign language and has many Japanese users learning English as well as many foreigners learning English Japanese, and other languages. The smart.fm office in Tokyo is actually about 2 minutes from my apartment. this site is an offshoot of Ameba blogs. It is focused on female fashions and has endless opportunities for advertising media to hook into. The article also reviews a couple of other successful SNS sites, including mixi’s end of year postcard [mixi年賀状], and a FANTA game. It is an interesting time to be involved with the internet at the moment, as main stream media take a close look at how they can cut expenses whilst reaching the maximum audience possible. Japan has its eye closely on what is happening in the US, and is likely to be a quick adopter / adapter of everything that works. Very good article. Smart.fm is one of my favorite sites to learn Japanese. I keep thinking that one day I'll wake up and it won't be there anymore. smart.fm certainly have a good following and I hope they continue to succeed. Happy learning ! I think you mean foreigners learning Japanese here. 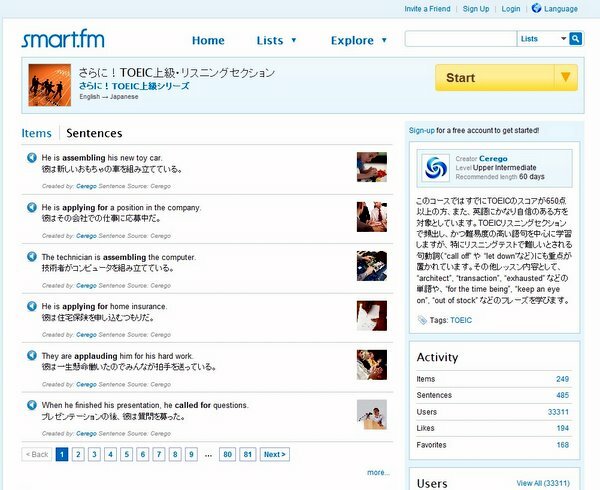 "smart.fm is a good way to learn a foreign language and has many Japanese users learning English as well as many foreigners learning English." I listen to Nikkei Trendy Podcast from time to time as a way to keep my Japanese up to speed. Good stuff! I couldn't imagine any Japanese politician having the base popularity required to grow a twitter following… other than Koizmi. It looks like the phenomenon that you mention here just keep growing and growing. It's very exciting to think about what might be next.. It sure is interesting. US based ideas tend to be broad and have wide scope. The mantra seems to be "You can do anything you want with this product". In Japan they tend to give people simple choices, "Set A, B or C", like at McDonalds. Whatever is next, it looks like it will help connect more and more people together to cross natural boundaries and cultural ties. very exciting. LOL, I think i might sign up for smart.fm to brush up my English. thanks fro pointing out the error.